Service Dogs by Warren Retrievers (SDWR) is seeking volunteer service dog raisers to assist the nonprofit organization in the vital work it does to fulfill its mission. Madison, VA, September 06, 2018 --(PR.com)-- Every working service dog starts as a puppy that needs a loving home to socialize and be nurtured. A Service Dog Raiser can provide that home and change a life in the process. 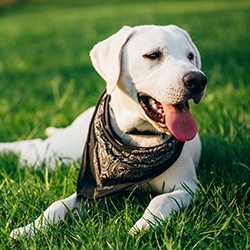 Service Dogs by Warren Retrievers, also known as “SDWR,” a 501(c)3 nonprofit organization based in Madison, Virginia, is seeking volunteer service dog raisers to assist the organization in the vital work it does to fulfill its mission. SDWR has hundreds of working service dogs placed with adults and children with invisible disabilities such as Diabetes, Autism, Seizure Disorders, and PTSD. SDWR places service dogs around the globe and is currently serving approximately 1,000 families. All of the dogs in their service work are either Labrador or Golden Retrievers. SDWR also places Doodles on a medical necessity validated by their organization with the recipient’s doctor. Service dog raisers receive their dog in training when it is approximately 4 months old after the dog has been fully vetted and vaccinated. The service dog raiser keeps the dog between a period of approximately 9 and 18 months. A service dog raiser is responsible for teaching their future service dog good behavior both at home and in public. The raiser also gives the dog exposure to what to expect and accept in this busy world. Service dog raisers will be asked to take SDWR service dogs in training everywhere - to work, to restaurants, on vacations, and even shopping. This real-world training imitates the experiences that their service dogs need to successfully help become the best service dog possible for SDWR clients. With the specialized vests they wear and applicable state laws, these service dogs in training can go where family pets aren’t allowed. Some of the service dogs in training are also honored members of the SDWR Fallen Officer Puppy Program. The Fallen Officer Puppy Program, also known as “FOPP,” is an initiative by SDWR to pay respect to the legacy of service by fallen American police who sacrificed their lives in the line of duty. These service dogs named for fallen heroes will carry on in memoriam of dedicated officers who sacrificed their lives in the line of duty. The Service Dog Raiser Program experience requires a great deal of dedication, time, energy, and focus. The dogs and raisers must follow through the foundation and skill set training provided through SDWR trainers at the facility in Virginia. SDWR prefers raisers to be local Virginia residents, but they are open to other neighboring states and areas within an 8 hour radius of their facility. This is a wonderful opportunity for parents and teachers to incorporate service dogs in training with their special needs children & classrooms. Quarterly training sessions and bi-weekly online check-ins are required as well. Service dog raisers are also required to post to SDWR’s Facebook page at least 3 times a week. As a service dog raiser, you will help the organization determine if the dog is suited to a career as a service dog. You can help the organization unite people in need with trained service dogs in this powerful program. You can raise a dog and change a life! Visit the Service Dogs by Warren Retrievers' website to review frequently asked questions at https://www.sdwr.org/service-dog-raiser-program/service-dog-raiser-faq/ to learn more or complete an application at https://www.sdwr.org/service-dog-raiser-program/ or call 540-543-2307.